Growing up, if you’d ask me my favorite veggie, you’d always get the same response: Green beans. Today, my response might not be so automatic, but green beans still reside as one of my favorites. Unlike many other veggies, green beans have a relatively mild flavor. This is likely why my childhood taste buds were so drawn to them. Holding true into my older years, when I’m getting tired of that sharp, dark-green veggie flavor, it’s green beans I reach for. Their neutral flavor is also great for cooking, allowing them to easily adapt to other ingredients thrown into the pan. Here, I add in balsamic-sweetened red onions and diced tomatoes for a little color, in addition to basil and gorgonzola, which star on the main stage for taste. 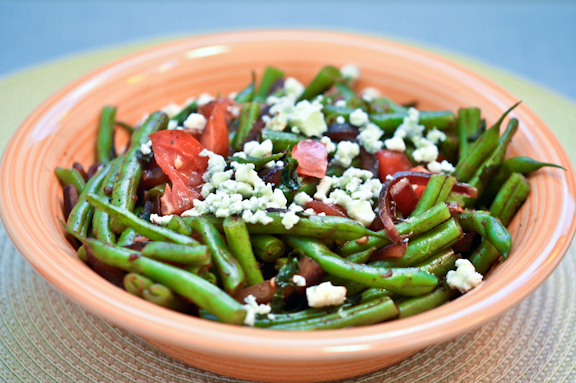 There’s nothing like a spruced up green bean dish to serve alongside the main entree when entertaining guests. No matter how tasty the entree, it always needs its veggie side kick. This one will take fewer than 15 minutes to make, meaning just a few extra minutes than simply steaming the beans. So when you’re feeling like getting a little fancy and dressing up those beans, keep this idea ready to go. Steam green beans for 8 minutes, or until tender but still slightly crisp. Meanwhile, saute onion in olive oil until translucent. Add basil, and cook until wilted. Add salt and pepper, to taste, balsamic vinegar, and tomato. Cook until tomatoes begin to slightly soften, about 3 minutes. Dice green beans into 2-inch pieces, and add to pan. Remove from heat. Stir in gorgonzola. Serve. Love green beans! This looks so fresh and fabulous, and healthy to boot, brilliant! I made this dish for my family as a side dish for Christmas dinner. I followed the recipe exactly, it seemed like the balsamic vinaigrette overpowered the other favors. I would say reduce the vinaigrette to 1/2 Tbsp and increase the quantity of Gorgonzola cheese to a 1/2 cup. Otherwise a great dish!